The starting point when considering what software to use in case preparation is: who will use the software? Organizing and preparing a case for presentation in court, or to the opposition in settlement negotiations, involves a lot of effort and clients who are willing to perform case organization work themselves can save a substantial amount in legal fees. Certainly, a client who can deliver to a lawyer for review and comment a well organized history of events chronology, backed up with documentation, and clear calculations where necessary, will pay far less in legal fees than a client who drops off a box of documents and provides a verbal summary of what occurred. This indicates that the answer to the opening question should: the client and the lawyer will collaborate in preparing the case and will both use the case preparation software! In order to both use the software both the client and the lawyer must have the software. Specialized litigation management software (e.g. Summation, Eclipse) offers relatively few advantages over Word, Excel, Outlook (with select plug ins), and Adobe (at least Adobe Standard, but ideally Adobe Pro) if properly and fully used. Therefore this paper assumes that the lawyer and the client will collaborate using commonly available software for Windows computers. discusses use of technology to facilitate case preparation, and provides cheat sheets for certain technology workflows that should be commonly employed by lawyers and clients in case preparation. Litigation is like story telling in many ways. Even before the pleadings commencing the court proceedings are filed, the parties to the dispute have typically had a long history living out a sequence of events that may eventually be recounted in court. Even if the history of the dispute before the filing of pleadings is not lengthy, civil cases typically move slowly through the court system and so even if the story was not long to begin with it will likely become long if the case goes to trial. Keeping detailed notes of past events is critical if one is to keep the story straight throughout this long process. Presenting a case to the opposition during settlement discussions, or to a judge at trial, involves each party presenting their version of the history of the dispute; their “version of the story”. Indeed, court judgments in factually complicated cases are not unlike novels, they can be long, and they tell the story as the judge believes it to have occurred. The story the court reports is generally a mixture of the stories told to it by the parties. A party who wants the court to tell the story the way the party believes things occurred has to get that story well organized, backing facts up with documentary evidence wherever possible, so that a convincing account can be presented to the judge who will hopefully accept your version of events. Even if the case does not go to trial (relatively few cases do) the better the story is presented and backed up the more likely the opposition is to believe that your version of events would be accepted if the case did proceed to court, and therefore the more likely the opposition will settle on favourable terms. It is sometimes jokingly said that real estate is about three things: location, location, location. Litigation is also about three things: preparation, preparation, preparation. But preparation is expensive if all done by the lawyer and can far more cost effectively, and thoroughly, be done by the lawyer and client working together. Case chronology (i.e. a date ordered narrative describing the history of events). Organized collection of relevant documents; referred to as a “library” of documents. Calculation (which should be prepared in an Excel spreadsheet). Almost all civil cases require a chronology and a library of documents. In many cases a calculation (e.g. of the amount owing on account of construction work) will also be required. The below discussion focusses on case chronologies and the library of documents, and not the calculation component because such calculations are very case specific and proper use of Excel for performing calculations is a large topic beyond the scope of this paper. Having well organized evidence to back up the facts relied on is essential to telling a convincing story. The client is the one with first-hand knowledge of the history of the dispute and if the client requires advice from the lawyer the client needs to communicate that history to the lawyer. Clients often just want to tell the lawyer the “key points” and then “get some advice”, but that approach assumes the client is able to identify the legally relevant information, which is often not the case. Rather, it is preferable for the client to efficiently communicate a detailed history of the dispute to the lawyer so that the lawyer can identify the legally relevant information and provide reliable advice. A common, and often very inefficient, way for the client to communicate information to the lawyer is for the client to simply describe to the lawyer what happened while the lawyer scribbles handwritten notes which inevitably fail to record everything that was described by the client. Further, information communicated in this manner is often jumbled, presented without reference to documents, and imperfect memories of past events often lead to erroneous information being provided. Instead of the lawyer and client sitting down for what is often a disorganized discussion, it is generally more efficient for the client to take the time to type up a detailed chronology describing the history of events. The chronology should be written up in a word document which can be supplemented over time as more relevant information is identified. Collecting information in a single well organized “history of events” document is more efficient than having important information dispersed in countless emails, faxes, and handwritten notes, and reduces the likelihood of important thoughts being forgotten. By jointly working on a history of events document the lawyer can guide the client in collecting and summarizing important information, and putting aside what is not relevant. Once the document is well developed, it may act as a draft settlement proposal / legal argument which the lawyer may edit (removing unhelpful information and strategy notes) and polish into a finalized settlement proposal / legal argument. Summarize the history of events document in a Microsoft Word document. The Word document should have an electronic table of contents to promote organization and allow easy navigation. See https://youtu.be/RcadhM6ZjGQ for how to make an electronic table of contents. The document will grow over time, but begin by simply writing down the key events in the dispute, and then add more and more information. Eventually, the document will become extremely detailed and be used a reference document to confirm historical facts. Each paragraph of this document should contain a single fact. Avoid long paragraphs that contain a mass of information. The paragraphs should be numbered using the paragraph numbering feature available in Word. Headings should be used to separate different events, or periods of time. The information should be presented in date order and specifics should be provided for all events i.e. describe the “who, when, what, where” of every event. If this seems overwhelming, start by putting down the information that seems most important and then provide the document to the lawyer for feedback. Whenever possible, facts should be substantiated by reference to documents. Describe the supporting document by describing the date and contents of the document. 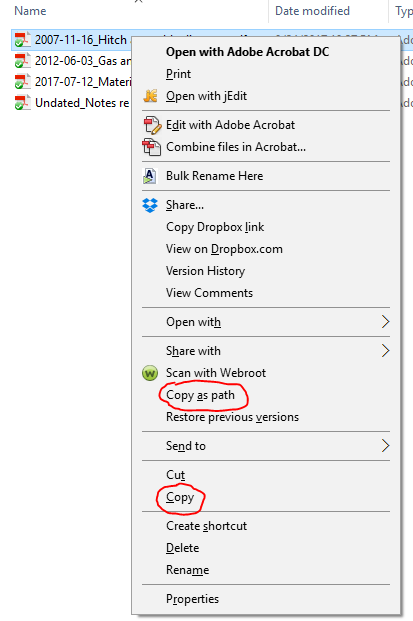 An efficient way to add a reference to a document that is already in pdf format and saved in the library of documents is to use the “copy as path” functionality of Windows Explorer, see explanation provide below. Where there is no document to support a fact added to the chronology there should be a description of who will be able to tell the judge that fact and how that person acquired the information. Where the evidence of witnesses will be relied on thought must be given to obtaining signed witness statements. Each time the history of events document is updated it should be saved with a new version number i.e. include a “v” and a number near the end of the file name to indicate the version e.g. “History of events v1.doc” and then update the version number each time the document undergoes a substantial update, or is emailed between the lawyer and the client. The fact collection and organization process can be very time consuming, even for simple cases. However, at the outset the client can save the lawyer time (and therefore the client money) by writing up a detailed history of events underlying the dispute. The more effort expended by the client (with corresponding reduction in time spent by the lawyer) in capturing the history known to the client, the greater the savings in legal fees, and the more likely accurate legal advice can be provided early on in the litigation. Documentation is an essential part of civil litigation, generally because documents are often considered more reliable that human memory. Proper document management, especially on files involving large amounts of documentation, is an essential part of effective case management. This discussion assumes that documents will be managed electronically, primarily in a folder tree containing pdf documents, although email review in Outlook will also commonly be part of the document management process. The starting point in document organization is that all relevant documents should be converted to pdf. Converting documents to pdf, and naming them using a logical file naming convention, is a lot of work but allows the documents to be easily accessed, shared (by email, or file sharing site), number stamped, and duplicated. Once a document is scanned there never needs be another trip to a photocopier/scanner to make a copy of it, and there is no loss of copy quality each time the document is passed on to someone else (as occurs when successive photocopies are made). Having a library of documents in pdf format with well thought out file names also allows extraction of data out of the pdf file names to automatically create a List of Documents which is typically required during litigation. The file name data can be imported into an Excel spreadsheet that allows sorting of document data, can facilitate quick access to the documents through hyperlinks, and allows notes to be added to the Excel spreadsheet during the document review process. Documents only available in hard copy to begin with must be scanned. All documents only available in hard copy to begin with must be scanned to pdf. As a general rule each document with a different date should be saved as a separate pdf file. This reduces confusion as to which document within a pdf file is being referred to, minimizes the problem of pdf file sizes being too big to email, allows discrete documents to be efficiently electronically merged into affidavits or books of evidence, etc. Therefore, each invoice, email, packing slip, contract, etc. should be saved in a separate pdf file and named according to the file naming convention described below. Invoices in Word format, web pages, Excel spreadsheets, etc. can be printed to pdf i.e. one does not need to print documents that are already on the computer to paper and then scan to pdf, but can print directly to pdf. To print to pdf, look at the list of printers that are available when you open the regular print dialogue window - there may an available “printer” named “Adobe pdf” or something to that effect. If so, select that as the printer and proceed with the print job. You will notice that instead of paper being printed, the information will be “printed” to a pdf file which you can then save on your computer. If you do not see “Adobe pdf” or something similar within the list of printers in the print dialogue box, then download and install “CutePDF” on your computer from http://www.cutepdf.com/products/cutepdf/writer.asp and then watch https://youtu.be/8-tbiEdhBhs for instructions on how to use it. Basically, installing that software will result in a printer named “CutePDF” being added to your list of printers and when you print to it will create a pdf rather than creating paper copies like a regular printer does. Once you have print to pdf functionality working you can print anything that could otherwise be printed to paper, to pdf. All documents printed to pdf should be saved with pdf file names in accordance with the file naming convention described below. eliminates the need for the lawyer to delete information from the email and convert it to pdf. When converting emails to pdf one should merge any attachments into the body of the pdf document that will contain the email itself. In other words if one has a one page email with a two page attachment (perhaps a Word document), then the pdf created for that email should contain three pages, one for the email itself and two for the attachment to the email. The Word document attachment should be converted to pdf and merged it a pdf document along with the email). The video https://youtu.be/1COv0WUEjZU shows how pages can be merged into single pdf documents if you have “Adobe Standard” software (i.e. a paid version of Adobe that has more features than Adobe Reader). Having the email attachments merged into the body of the email is important to ensure that attachments are number stamped, are searchable if the pdf is OCRd (see discussion below), are readily visible if the pdf is merged into an affidavit draft, etc. allows automatic generation of a list of documents (see discussion below, or simply creating a working list of all dispute documents for use in a chronology etc.). The following sets out detailed rules for file naming, and although these rules are detailed they are designed to facilitate automatic electronic generation of lists of documents and management of document data in Microsoft Excel. 1. An underscore must be used after the last digit of the date (this serves as a marker so that the date can later be separated from the description when creating a List of Documents). 2. There is no space between the underscore and the start of the description. 3. Apart from the underscores preceding the description, do not use underscores anywhere else in the file name as that will interfere with manipulation of data in Excel. 4. You must include the dashes and not use spaces between the numbers in the date, or else Microsoft Excel will not recognize the dates. 5. Be sure to enter eight characters for the date, four for the year, two for the month and two for the day e.g. “2011-03-05”, not “2011-3-5”. 7. If the document has no date, begin the file name with the word “Undated” before the underscore e.g. “Undated_Invoice.pdf”. However, always give a document a date if you can discern one from the document i.e. “Undated” documents are not ideal. If you can determine the month and the year, but not the day, then use the last day in the month for the day e.g. “2011-05-31_Accounting notes.pdf”. 8. The description should be “self-contained” in the sense of being suitable as a stand-alone description for a List of Documents i.e. it should make sense when read on its own. For example, don’t use descriptions like “memo”, “scan 0012345”, or “letter”; be more descriptive so that the it will be clear what the document is when browsing the electronic folder containing the pdf files. See examples above. It is good for the file name to indicate the nature of the document e.g. “2015-09-24_Unresolved issues.pdf” does not tell us what type of document it is (letter, email, fax, site instruction, meeting minutes?). Ideally the first part of the file name will indicate the nature of the document e.g. “2015-07-10_Letter from S. Smith re unresolved issues.pdf”, because that stands out when visually reviewing a list of documents. 9. Descriptions should generally never be more than about 30 characters. 10. Don’t use abbreviations that may appear informal i.e. use Ms. Smith, or “Joan Smith”, not “Smith”, or “JS”. 11. Generally use names for people instead of descriptions e.g. “Mr. Smith” not “the owner”. 12. Avoid abbreviations like “Ltr” or “LT”, write out the word “Letter”. 13. Don’t use hashtags (#) in the description, they disrupt the operation of links in Excel. The pdf files in the library of documents should be organized into relevant subfolders folders in a folder tree e.g. all of the documents related to a particular part of the job, or a particular subcontractor, can be placed in a single subfolder. The subfolders should be given logical names, and in some cases it will be useful to have subfolders within subfolders. The naming and number of subfolders will be heavily dependent on the nature of the case. Subfolder names should be relatively brief. While relevant emails will often ultimately be converted to pdf and included in the folder tree containing the library of documents as discussed above, it cases involving large amounts of email (e.g. 10+ employees involved in a project now under dispute all been sending emails on the project for the past 2 years, resulting in tens of thousands, or more, of email) it will generally be preferable to review email in Outlook. Apart from the powerful search tool built into Outlook, through use of pst files it is possible to amalgamate email from various sources and then run deduplication software to eliminate duplicates and facilitate efficient review of historical emails. Where Microsoft Outlook has been used for email and the user has saved email to a folder, that entire folder can be saved to a pst file, which is a special Microsoft format data file that can store a collection of emails and attachments. pst stands for “personal storage table”, and a pst file can act as a database of all emails in a folder. If the user does not ordinarily use folders but relies on search, searches can be done to identify relevant emails which can be saved to a folder and then the folder can be saved to a pst file. If the user does not use Outlook as an email client other types of database files can be converted to pst file format with inexpensive software. Having a pst file is valuable for the recipient because it allows the entire collection of emails to be imported into Outlook on the recipient's computer and the resulting folder in the recipient's Outlook can be keyword searched, and browsed, to find relevant information. in the next window make sure the folder you want to export to the pst file is highlighted, and that the “include subfolders” box is checked, and then click “Next”. Specify the save location, and under the “Options” list click “Allow duplicate items to be created”, and then click “Finish”. Your pst file should then be created (it might take a minute or so) and saved in the location you specified in the final step of the process. Pst files may be too big to send as an email attachment, in which case they should be saved to a shared folder or copied a USB key. 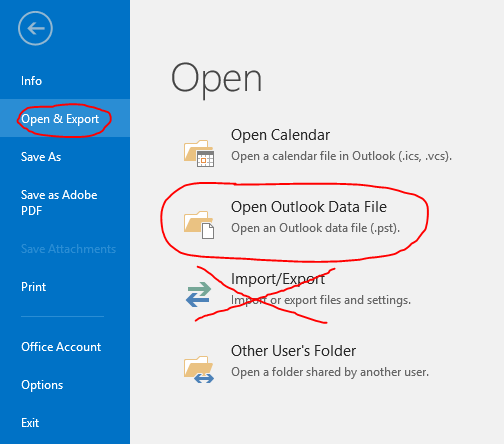 Click “File”, “Open & Export”, “Open Outlook Data File”. Browse to the pst file you want to open and then click “Open”. You should then notice that there is an additional “Mail folder” listed on the menu on the left side of Outlook (look near the bottom of the menu on the left), and you should be able to browse the pst file. Be careful to NOT “import” the file, but rather you must “open” it. If you “import” it may merge all of the emails in the pst file with an existing set of emails in the Outlook account which is not what you want i.e. you want the emails in the pst file being opened to be in a self contained folder, not mixed in with emails related to other matters. Where the emails from the email accounts of multiple people are merged into one, duplicates may occur e.g. the same message is in the “Sent items” of person A and in the “Inbox” of person B. 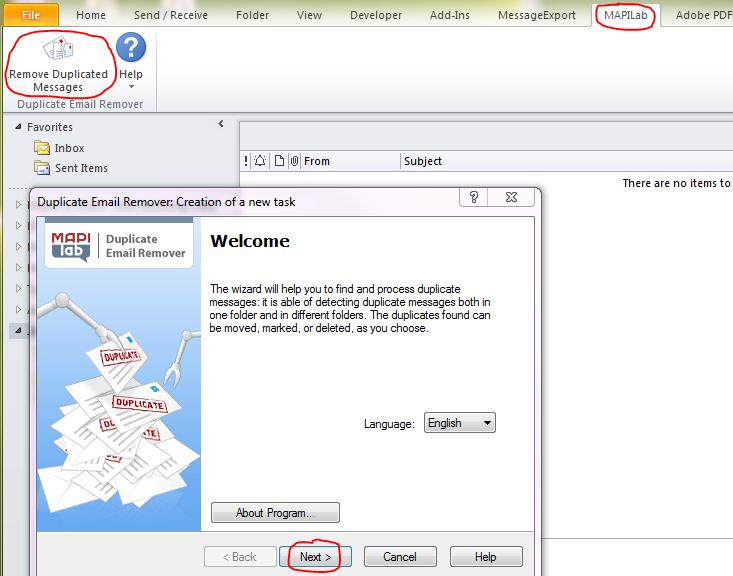 The “Duplicates Remover for Outlook” software (https://www.mapilab.com/outlook/remove_duplicates/) from MapiLap can be used to remove duplicate messages. The software can be run on an individual folder to remove duplicates in that folder, or across multiple folders using folder priority to specify which copy is deleted and which is left in place. 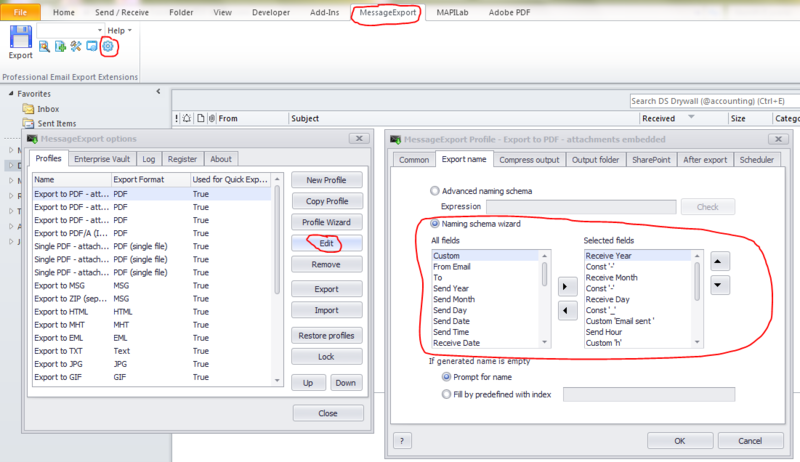 Duplicate messages can be moved to a specified folder for review after the software has run (e.g. so that the paranoid user can do some spot checks that those that were removed were truly duplicates). Message export ( https://www.encryptomatic.com/messageexport/ ) is software by Encryptomatic that allows email messages to be exported from Outlook, named according to a user defined file naming convention, and saved with the attachments converted to pdf and merged into the body of the pdf, all at the click of a button. Relevant emails can be exported to pdf, either individually or in batches, and as mentioned an option can be selected to convert the (non pdf) attachments to pdf and merge them into the pdf file containing the body of the email. This typically works well for word documents, or image files (e.g. jpeg, png, etc. ), but does not work well for large Excel spreadsheets i.e. the content is shown in the resulting pdf but the print areas may not be ideal and so the resulting pages can be difficult to read. Consider using it for emails with Excel spreadsheet attachments in any event and then important spreadsheets can be subsequently provided in native format as requested. OCR stands for Optical Character Recognition, which is a process that can be run on pdf documents using software that recognizes text and makes the document text searchable. OCRing a document allows keyword searches to be done within the document itself, and also allows search of all documents in an OCRd library of documents to be full text searched, and is therefore an important part of managing documents. 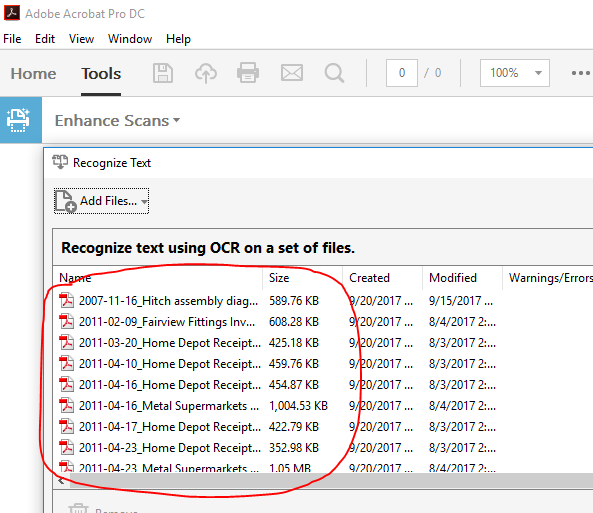 Adobe Reader does not have the ability to OCR documents, but Adobe Standard and Adobe Pro both have the ability to batch OCR a library of documents and the following sets out the process. Navigate to the folder that you want to OCR the documents in. In Windows Explorer, select the folder path, such that it is highlighted in blue, and then press Ctrl-C to copy the folder path to the clipboard. 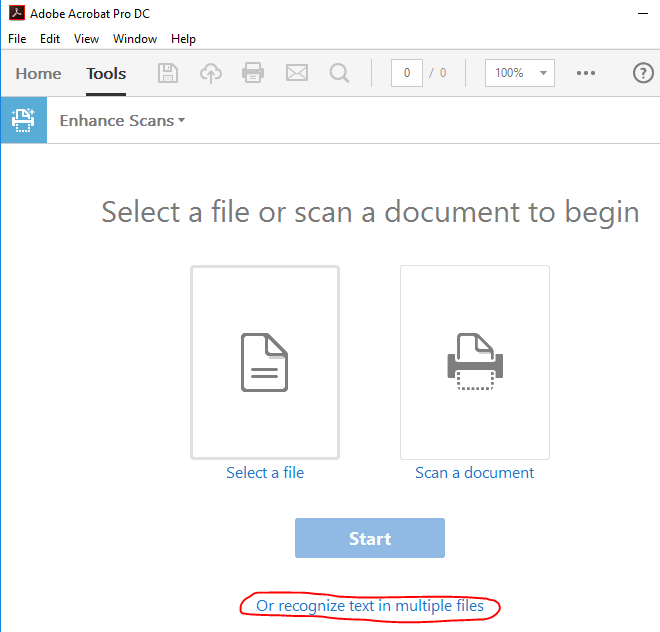 Open Adobe, and go to “Tools”, “Enhance Scans”, “Recognize text in multiple files”. Click the “Add files” drop down menu, and then select “Add Folders”, and then copy and paste the folder name from your clipboard into the “Folder” field. Click “OK” to proceed with batch OCRing the library of documents, and the pre-existing files should be overwritten with the OCRd documents. It may take a while if there are a large number of documents in the database, but you can leave this process running overnight if necessary. Doing full text searches of the library of documents is a valuable tool for identifying important documents. Where a library of emails is contained in Outlook full text searches can be done in Outlook and indeed users may revert to searching the Outlook database of emails even after key emails have been converted to pdf for inclusion in the pdf library of documents saved in the folder tree in Windows. 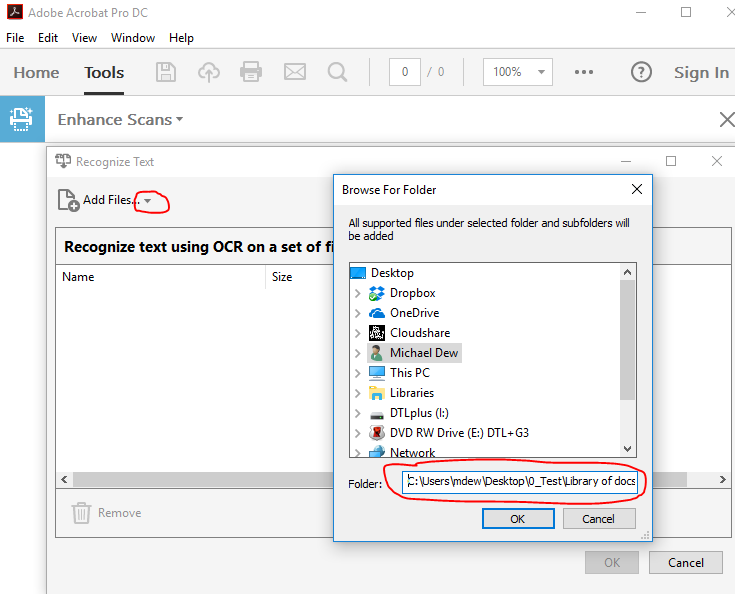 However, steps should also be taken to index the pdf library of documents in the folder tree in Windows so that it can be searched using full text searches. Some law firms have server indexing tools (e.g. the Microsoft Sharepoint search tool may be set up to index the server), but if that is not available then a copy of the library of documents can be copied to the C: of your computer and the indexing options set to ensure that the folder containing the library of documents is indexed. OCR the library of documents (see discussion above). 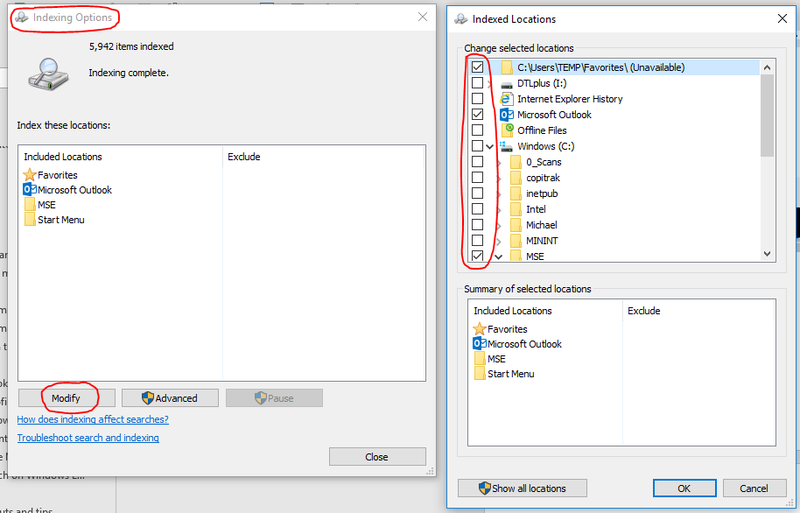 In the Indexing Options dialogue box, click “Modify”, and then, in the window that pops up, use the expanding menus as necessary and check the boxes for the folders you want to index. Be sure to leave the box for Outlook checked so that your email is still indexed, but uncheck the boxes for folders you are not interested in so that when you rebuild the index you do not have to wait for it to index folders that you are not interested in. If you want you can go into the “Advanced” dialogue box (see button to the right of the “Modify” button in the image above) and specify the types of files that you want indexed, but this is generally not necessary, especially if you reduce the folders to be indexed because that will prevent longer indexing times due to obscure file types (typically system files) being indexed. After you have made changes and then closed down the “Indexed Locations” dialogue box (see right side of the image above) the index should automatically start rebuilding and the status of the indexing should be indicated in the top left of the “Indexing Options” dialogue box (see “Indexing complete” notation at the top left of the image above). 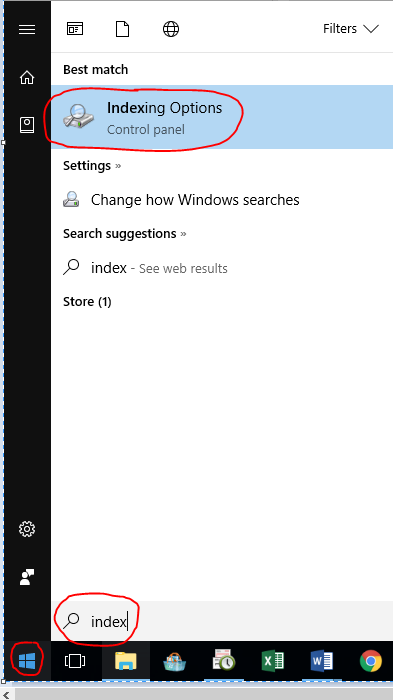 Once indexing is complete you can go to the search filed in the top right of the windows explorer and search for keywords. Both file names and file contents (of OCRd files) are searched, and in context previews of search results are provided. Every document, and folder, on a computer has an address, or “path”. 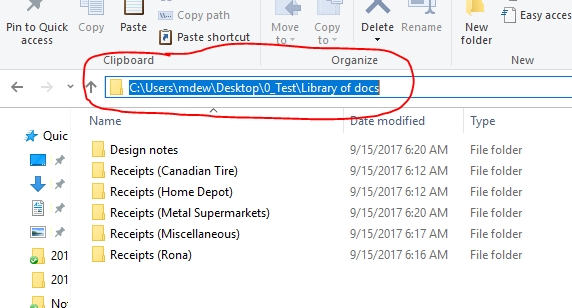 To see the path of a folder you can click the address bar at the top of the windows explorer window (see highlighted in blue below). from the menu that pops up, click “Copy as path” (this will copy the “path” of the file to your clipboard). The one on the left shows the pop up window for a regular right click on the file (“Copy as path” not shown as an option”). The one on the right shows the pop up window for a shift right click on the file (“Copy as path” is shown as an option”). In addition to being a powerful tool for handling data (further discussed below), the “Copy as path” tool is useful for simple purposes e.g. A convenient way to email someone in your office the path to a document saved on the server i.e. rather than sending an email attachment which results there being three copies of the file – the one on the server, the one in your Outbox and the one in the recipients Inbox, clogging up server space. A convenient way to indicate the location of a file saved in the library of documents when discussing the document in the history of events document. Using the “Copy as path” tool described above, all of the data contained within the file names of the pdf documents in the library of documents can be exported to Excel, and then used as list of documents (as required under the Rules of Court), or used as the starting point for a chronology. Navigate to the top level folder of the library of documents. Search for “.pdf” in Windows File Explorer, this should bring up a list of all pdfs in the library of documents. Press Ctrl-A to highlight all items in the list of files. 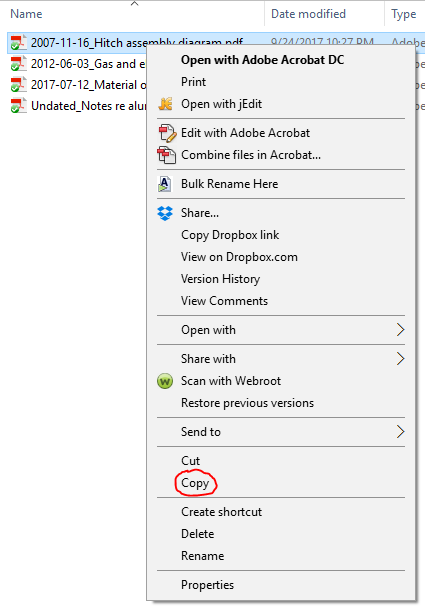 Shift right click, and copy as path, to copy the paths of all files to the clipboard. 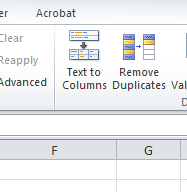 Paste the data from the clipboard into Excel. Identify the portion of the path that you wish to eliminate and not have as part of your list of documents (typically the entire portion up to, but not including, the top level subfolder names in the library of documents), and copy that text to the clipboard. Press Ctrl-F to open up the “Find” dialogue window, bring up the “Replace” option, paste the text from the clipboard into the “Find” field and leave the “Replace” field blank and then proceed. This “find and replace with nothing” method will truncate the paths and remove leader text not needed. Break up the remaining path into folder names and file names using the “Text to Columns” tool in the “Data” group of the ribbon in Excel, using “\” as the delimiter for separating the component parts. You can also separate the “date” and “description” portions of the file name using the “Text to Columns” tool, using the underscore as the delimiter for separating the component parts. This is why, as discussed above, it is important to have only one underscore in the file name i.e. if you have multiple underscores then it will split up the file into unwanted parts. The above should provide you with a list of files in Excel which can be sorted, and links can be added to allow quick opening of the documents using the hyperlink command in Excel i.e. =+HYPERLINK(cell reference to cell containing the document path,"Link"). One can also use the Bates numbering feature in Adobe Pro to batch Bates stamp all of the documents in the library of documents, and then import the Bates numbers into the Excel spreadsheet. Litigation is expensive, especially so in the case of fact intensive construction disputes. Clients should not pay lawyers to do the time consuming work of fact preparation and document organization: the clients have lived the history of the dispute and are at the outset the holders of the relevant information, and properly guided they can organize the facts. Indeed, the initial role of the lawyer should be to guide the client in collecting and organizing the documents and information, and then the lawyer and client should collaborate towards preparing a detailed narrative history of the relevant facts, backed up by a library of documents, and typically supplemented by a spreadsheet calculation of the amount in dispute. Various litigation software is available, but it is essential that the lawyer and client both have access to the software to be used so that they can effectively work together, and it is not economical for the lawyer to sit in an ivory tower with “fancy” software that the client does not have access to. Further, properly used (this paper provides merely a snapshot of a few skills) the standard tools (Word, Excel, Outlook (with a few plug ins) and Adobe) are powerful and often sufficient for effective case organization and management. Lawyer client collaboration, with a commitment to technology skills development, is an important part of efficient and cost effective case preparation and increases the chances of getting the client to where it wants to be as quickly as possible: achieve a fair and reasonable resolution of the dispute without breaking the bank through lawyer fees, and move on to the next project!